Really cute scene!!! I can relate to this it is xactly how I am feeling at this moment! Bless you, bless you little mouse. How many sneezes can you make. Poor little soul get better very soon. Brilliant and SO life-like! I expected to hear small sneezes while I admired your work. All you can do is really wonderful, you're talented artist! congratulations! 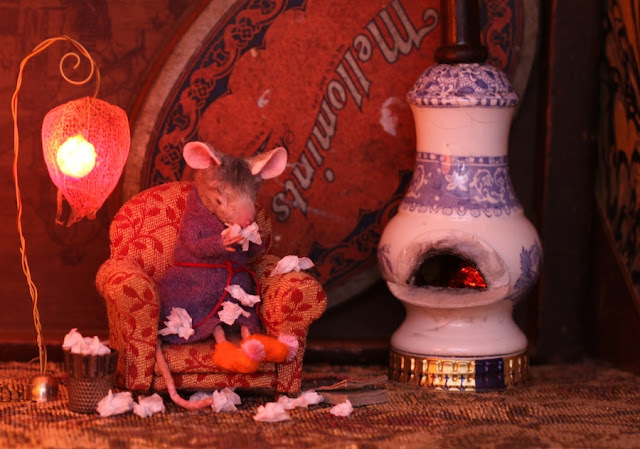 Your mice, the environments look real and have life! O`poor tiny mouse! I am so happy she is having the fireplace! The athmosphere is wonderful! Bless you! Hope your well again soon. I had so much fun looking through your blog-your work of art is so inspiring. The metal ring at the base of the fireplace is throwing me off... Salt shaker? Bedknob? Fireplace base is the lid of an anchovy tin. Thanks for all your great comments..You're also the first person (I think) to listen to the whole podcast! I kept getting interrupted with phone calls and email while trying to listen! - You both did a great job. That was a fun interview. a familiar scene happens at our home too, wish she recover now.